Shane Baz wants opponents to know he's out there to intimidate them, and that's before he even throws his mid-to-high-90s fastball. "It's just about being a good presence on the mound," Baz said. "When I'm out there for warmups, I'll give the ball a good sniff, see what it's smelling like. I'm out there to dominate. It's all about thinking you're the best player on the field. If the hitter knows you're going to come at them like you're the best one out there, then you've already got an advantage." 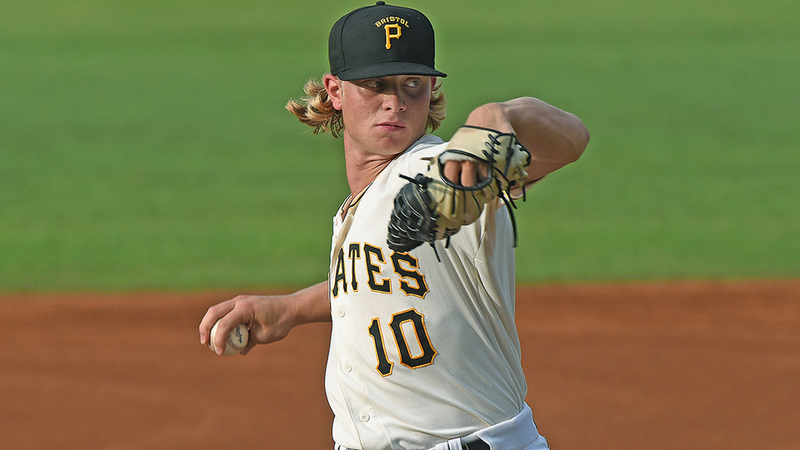 The way Baz is pitching lately, Appalachian League batters may not need to watch his on-the-mound antics to get the picture. MLB.com's No. 95 overall prospect has been named the Appy League Pitcher of the Week after tossing back-to-back scoreless outings for Rookie-level Bristol for the first time this season. This is Baz's first Pitcher of the Week honor since the Pirates took him 12th overall in the 2017 Draft. The 19-year-old right-hander was one of nine Appy League pitchers to make two starts between Aug. 6-12 but the only one of the bunch not to give up an earned run in that span. First, he struck out six and scattered four hits and three walks over 4 2/3 innings last Monday at home against Johnson City for his first scoreless outing since his season debut on June 20. He followed that with five more zero-filled frames Saturday against visiting Greeneville, striking out six again while giving up three hits and a walk. As a result, Baz lowered his ERA from 5.05 at the start of the week (fifth-worst among league qualifiers) to 3.97 (fourth-best) with his 9 2/3 scoreless innings. "It comes down to trying to dominate with the fastball," said the Texas native. "Working it to both sides, that's been really good lately. The hitters have had a really tough time with the fastball in, so that's something I've learned. But really, it's just about bringing the fire, pitching with emotion and really competing every time I'm out there. This has been a really fun experience from extended [spring training] to getting under the lights here." Pittsburgh drafted the 6-foot-3 hurler because of the plus velocity he showed at Concordia Lutheran High School, but also for his potential to show an above-average cutter, slider and curveball. He emphasized that during his prep days he could get results by relying on his heater, and he's still pursuing that strategy now. "In high school, I could just rear back and throw it," he said. "Maybe I'd have to mix in an off-speed if someone made hard contact. But really, I wasn't even worried about location. Here, I'm working on intimidating guys right away from the first inning, and that still comes with the fastball. I'm learning a lot about what guys can't hit, and that comes a little bit more from location than it used to." Baz has walked 11.1 percent of the batters faced, but he leads the Appalachian League with a 26.1 percent strikeout rate while a majority of the contact against him is coming on the ground. Not only does Baz's 62 percent groundball rate lead the Rookie-level circuit, it also ranks seventh among the 628 qualified pitchers in the entire Minor Leagues. Part of that comes from keeping the fastball down, but the Bristol right-hander also credits an increased confidence in his changeup for improving his ground game. "It's like [pitching coach Joseph] Seaver says when I'm in my bullpens, 'OK, it's a 3-2 count, throw a changeup,'" Baz said. "I practice it so much that in games, I'm not thinking, 'Oh man, I don't know about my changeup, I shouldn't throw it here.' I can just do it. It's got a lot of sink to it, and it'll miss a lot of barrels when I throw it like I have." With the Appy League schedule concluding in just 16 days, Bristol sits 3 1/2 games behind Elizabethton in the West Division standings and two games back of Kingsport for a Wild Card spot. The club went 6-2 during Baz's award-winning week, and the hurler feels like both he and his team are peaking at the right time. "I'm just going to build off these last two starts best I can," Baz said. "I want to put my team in position to get wins every time I'm out there, and we all feel like we're on the brink of something big here. The BriBucs are getting hot right now, and I'm just bringing the energy I can to keep that up."